Your Central European river cruise begins with the spectacular views of Budapest-the "Pearl of the Danube." Cruise to Vienna, "The City of Music," for guided sightseeing of the historic Habsburg Empire-including the Imperial Palace, Vienna Opera House, and stunning St. Stephen’s Cathedral. Visit delightful Dürnstein and Melk-charming towns in the vineyard-rich Wachau Valley. Tour the magnificent Benedictine Abbey high above Melk. 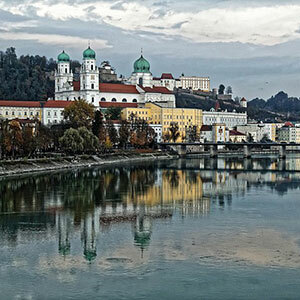 Enjoy a guided city walk through the "City of Three Rivers"-Passau-before sailing to Regensburg. You’ll also visit Roth for guided sightseeing of the Bavarian town’s timbered houses, or take an excursion to tour Nuremberg’s historic sites or the WWII Rally Grounds. Take an excursion from Nuremberg to Munich for a full-day tour, including Nymphenburg Palace. In Bamberg, tour the city of seven hills crowned with churches. Visit a charming Bavarian Main River village, and tour Würzburg-the "Pearl of the Romantic Road." Hear German music from some of the 350 self-playing instruments in Rüdesheim’s Mechanical Musical Instrument Museum. 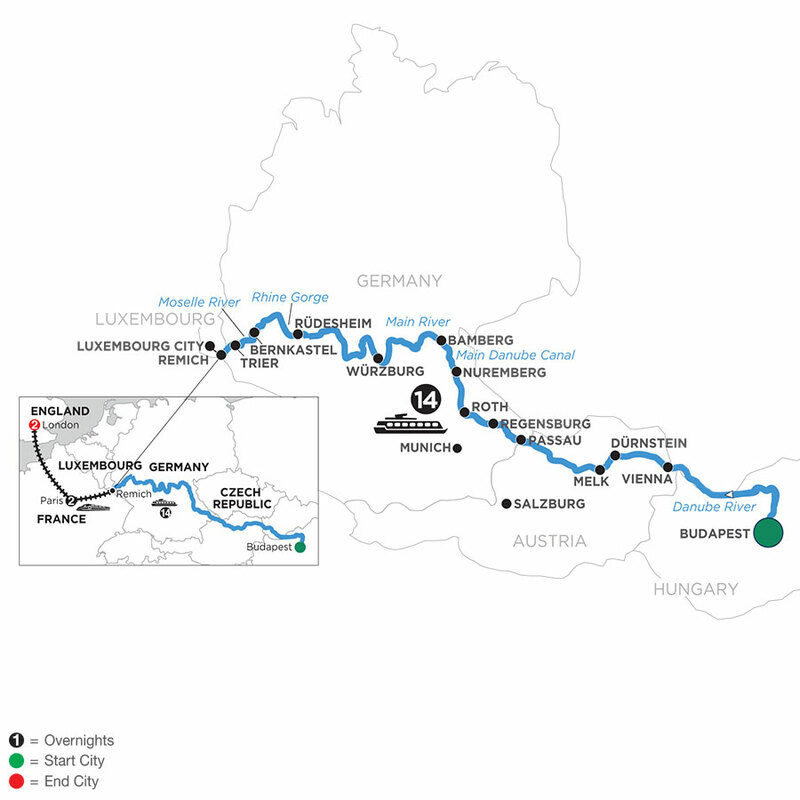 Next, sail through the spectacular Rhine Gorge on your way to the charming wine village of Bernkastel. Sail into Luxembourg to join an excursion from Grevenmacher to see the ancient Roman sites of Trier. Disembark your Avalon Suite Ship® to continue your European vacation in Paris and London! Enjoy buffet breakfast daily, your Monograms Local Host® for guidance and assistance, destination guide with city map, and transfers to or from ship, hotel, and train stations. Begin with two nights and guided sightseeing in the "City of Light." Also, enjoy free time to explore Paris on your own with guidance from your Local Host. Next stop, London via Eurostar high-speed train. Explore the city of Buckingham Palace and Big Ben with guided sightseeing and free time to enjoy its people, pubs, and places.